My daughter read my last post and told me that I am a terrible writer. That I don’t know how to use a comma. And that many of my sentences are fragments. They lack verbs. Ouch. Apparently I violate many of the rules of the written English language. She is in high school. There are a couple positives that came out of the conversation: 1) the Seattle Public School District is teaching her something; 2) I am annoying her. Good job David. Anyway, why is my writing worse than her texts? She sent me this message: “Where r u”. So you are reading the blog of an illiterate. Which should be impossible. 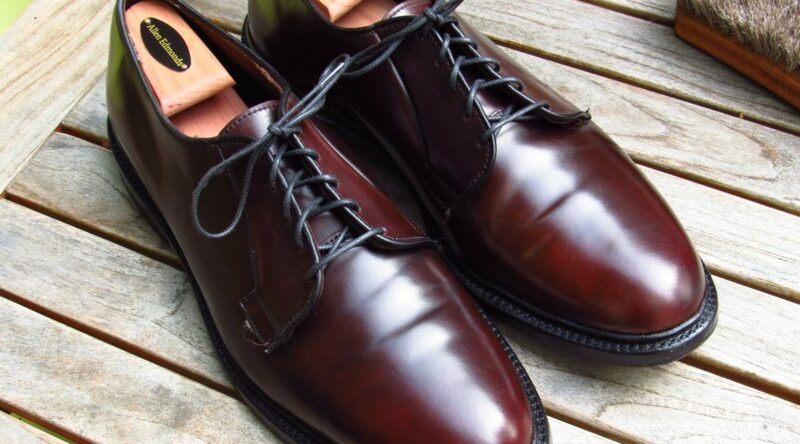 Another impossiblity is me blogging about a shoe style that isn’t a long wing or plain toe blucher (PTB). I know. Sorry. 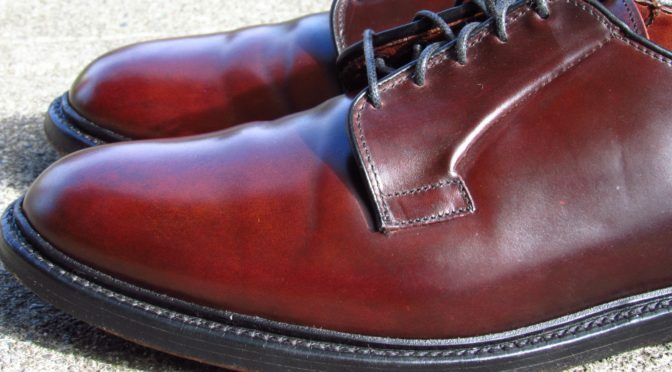 This PTB model is the Leeds by Allen Edmonds. 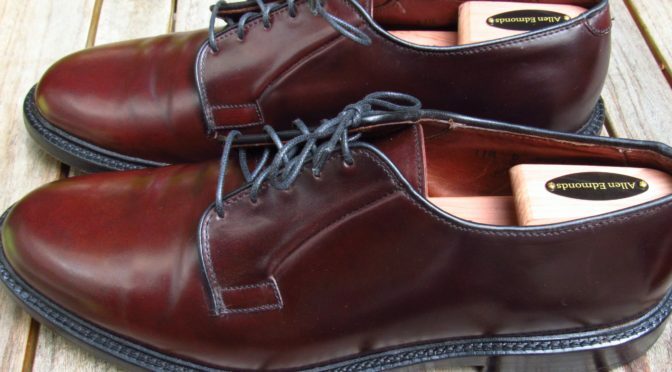 Allen Edmonds has been making this model since the 1960s. I am not sure what year this pair was produced but I emailed a photo to Allen Edmonds customer service (which is great), and they said the pair was made prior to the start of their records (2008). 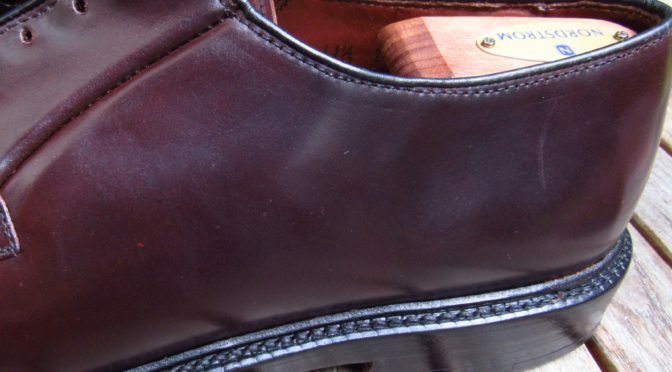 I have worked on a lot of Shell Cordovan shoes and each pair is a bit unique. Ron Rider on his blog once commented that there is no “best way” to condition and shine Shell. It depends on how the shoe manufacturer finished the Shell and if vintage, what has happened to the shoe since it left the factory. 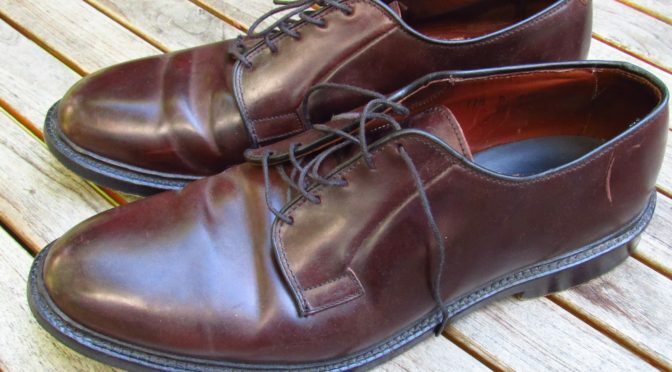 The Mac method might work well for new-ish Alden pairs but I have found most older shoes need moisture … and chemical cleaners. Looking at this pair, I could see the leather was dry. The factory finish (?) on the Shell was wearing off in some areas. There was also a deep scratch on the left shoe. 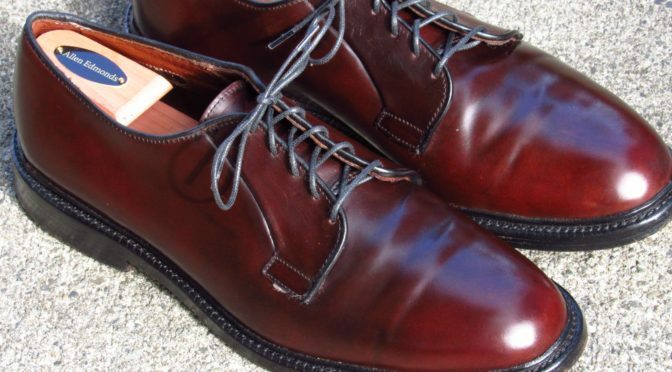 I gave the shoes a wipe down with a damp cloth and a good brushing. I then decided to treat the left shoe first and started with gently applying Saphir Reno’Mat. The leather was still a bit rough so I did a light, wet sanding using an ultra-fine grit sanding sponge (3200 grit) and Lexol NF. This made the Shell very smooth. In the photo below, the lower shoe has been sanded and the upper shoe has only been brushed and wiped. Lexol NF leaves the shoe feeling a bit tacky so I used Bickmore Bick 4 to remove the tacky feeling and to give the Shell a bit more moisture. 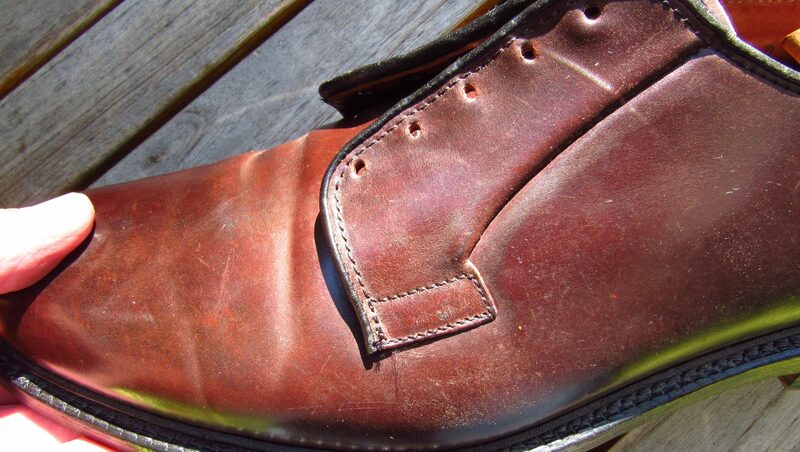 The conditioning and sanding greatly reduced the deep scratch on the left shoe. The Shell was now somewhat raw. The conditioning made it feel moist and oily. In this state, it was like a pull up leather in that it would scuff or scratch easily but you could rub the scratch out by rubbing your thumb on it. I thought about keeping the shoes in this raw state but just handling the shoes was leaving some scuffs. Which was annoying. I decided then to finish the shoes with two rounds of Collonil 1909 Supreme Cream Deluxe in Neutral. Collonil 1909 is a great product and is a bit like Venetian Shoe Cream or Saphir Renovateur but with a higher shine. After two applications of Collonil 1909, the shoes resisted scratches. And looked great. The wet sanding of the leather was a technique that I hadn’t done before but a Japanese blogger wrote about success doing it in a recent post. Since they were PTBs, it was easy to do versus a heavily brogued long wing. I am done with this post. In the next post, I might improve my grammar. Or I could make it worse. Maybe. I. Will. Write. With. A. Period. Between. Each. Word. That would annoy someone I know. Yes. Thanks for the belly-laugh combined with a really interesting article! Like you, I purchase vintage shoes. I once purchased a pair of Dinkelacker goyser stitched PTB’s and researched them after the fact. Their website gave me a really valuable tip which I’d like to pass along. 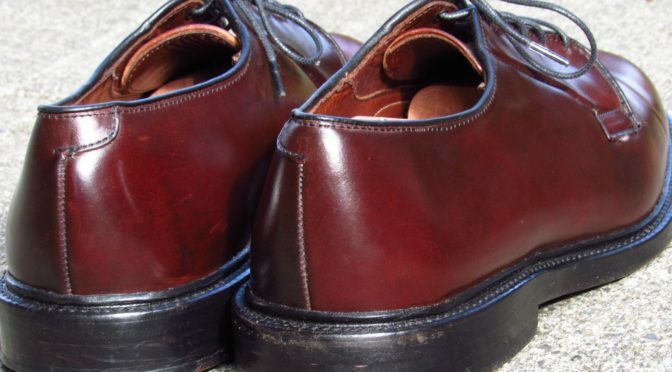 Rather than using edge dressing on the soles, try using a jumbo size permanent felt tipped pen from Home Depot. It works very well and is much easier to apply and when finished with a top coat of Kiwi wax looks like new. Of course if you try it and don’t like it I’ll deny it ever happened, just like Donald would! Thanks. I haven’t tried the felt tip pen but sometimes I do use a wax on the edge. I haven’t found an edge dressing that both matches the color and gives a gloss finish. Looks great! I never thought about using fine grit sand paper but really working on a shoe is not much different than working on a car. 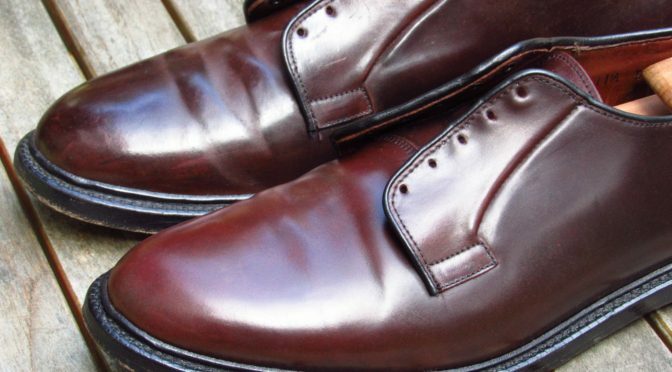 How do you disinfect your vintage shell cordovan? I use a UV sanitizer that I bought on Amazon. I have the Sterishoe +. Do you think they work? 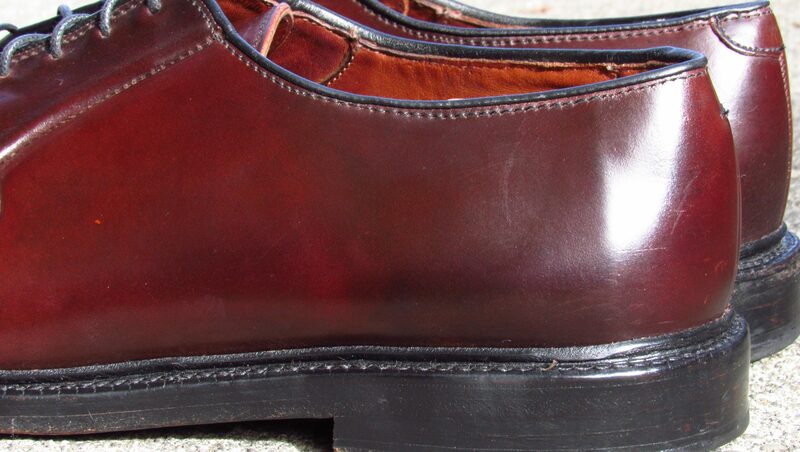 Was inspired by your post and picked up a pair of Alden Single Monk Strap Shell Cordovans on eBay for $150.00. I’m just getting started but the worst part so far had to of been the removal of the sock fuzzies in the toe region. At least the previous owner didn’t go sockless! I haven’t used Sterishoe but the Amazon review are good. Your sentences. Look fine. To me. Now about the shoes – I recently bought a pair of pre-owned, shell AE Leeds, on ebay. I also bought a deer bone and a jar of Saphir Cordovan Cream. Should I use the bone first, then apply the polish? Or do I need to buy some Reno’mat to take off the old polish first? Or maybe just toss them in the dryer with a handful of gravel, for that lived-in look? Help! Yes, I would start with the bone first. It should help condition them. Then one or two rounds of the cream. I have worn my Leeds frequently. They are a good shoes. Interesting approach with the wet sanding, David. Can you provide any tips on how to do this? Would I do this with neatsfoot as a lubricant, or perhaps with mink oil? How much pressure did you lay down with the sanding sponge? Thanks! Neatsfoot oil would work well. You should use very light pressure. You are just trying to smooth the surface. A high grit sandpaper feels almost smooth. I just got a practically NOS pair of 93606s. They were a little dirty. i cleaned them by wiping them and then used VSC and a light round to Renomat. The shell was rough in some spots so I did a light sanding. It helped. I conditioned with Bick 4 and Saphir renovatuer. But now they are in the same raw state that you mentioned. They seem to scratch very easily. The scratches buff out easily too. But none of my other shells are this sensitive. I don’t own Collonil. Should I use more renovateur? More VSC? Inwotry that they may over over conditioned. Thanks! I think you need to apply more waxes to the surfaces. That will help avoid scuffs and scrapes. You might try a hard wax or cream. Colored or neutral. Great. Thanks. I have Saphir cordovan cream. Would that work? Thanks. Some people strip off the acrylic coating with alcohol to expose the shells true patina and luster. I did that to a pair of 93605s where acrylic coating was already coming off. Not sure I’d do it to a pair where the acrylic coating was intact. How do feel about that? I promise that’s the last question. Thanks. Yes, i don’t recommend stripping the pair unless the surface coating is uneven or damaged.